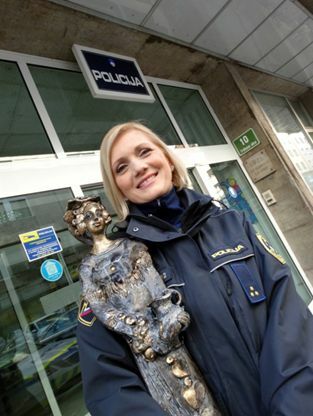 This year the winner of the Woman of the Year Award, as selected by the readers of Zarja, is a police officer from Ljubljana, Mirela Čorić. 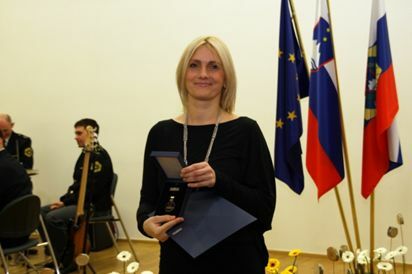 Mirela is a remarkable woman and a brave and courageous police officer. Four years ago she received an award for bravery after apprehending, on her own, two jewellery store robbers, and this year she received an award for selflessness after saving a neighbour from severe medical consequences. She still regularly visits this elderly lady, bringing her a warm meal every day. Life has presented her with many challenges – a single parent herself, she welcomed into her home, just over four years ago, her nephew, as his mother, struggling with addiction, had not been able to take care of him from the day he was born. Another reason for her being awarded the woman of the year and the good fairy title was the fact that two years ago she dissuaded Vili, a homeless person, from committing suicide. Now, Vili no longer lives on the street. What do the award and the title mean to you? In material terms, nothing, but I am happy that my work is supported, appreciated and respected. It also means a lot to me that people voted for an ordinary police officer, as other this year’s nominees were all remarkable women. It is interesting how during the voting for the woman of the year, police officers joined their ranks. I was also pleasantly surprised by the fact that citizens and police officers, including those who did not even know me, invited people to vote for me. Where will you put the statue? The statue has already found its place in our living room. You do such a thing if you have it in you, spontaneously. And even if you freeze, there is nothing wrong with that. In such moments you realise what you are made of. Until the present day, I have carried out several interventions on my own. There was another case where I apprehended a burglar who was breaking into a vehicle. It has nothing to do with whether you are a male or a female, it is more about whether you have it in you or not, and how you react under adrenaline. Were these personality traits the ones that led you to become a police officer? Most probably, but also the fact that I like working with people. I was in a partnership with an abusive boyfriend and I stood up against it. This gave me the will to help women who were in a similar situation. But I decided to become a police officer already in primary school. How is it like to work at one of the busiest police stations? Here one officer does the work of four. When we get officers helping us from other police stations, they often ask us how we can stand it, but we are not even aware of that. I am a community policing officer in the district of Tabor and Kolodvor, which include Rog and Metelkova. We just push forward and keep working. Since this is an area faced with significant security challenges, we collaborate a lot with non-governmental organisations, as there are many problems with the homeless and consequently, drug abuse is accessible and visible to everybody, so we make great efforts to help these people find goals in their lives. Your approach is especially visible in working with the homeless and people with drug problems. I say that you must be a human first and work with your heart and without prejudice. These people have sad stories and they were not strong enough to fight them. Many come from families where there were alcohol or domestic violence problems. I am constantly thinking that my children could become drug abusers tomorrow and they will need someone like me to help them. I myself have a sister who is like that, struggling to stop using drugs, but it is hard. I understand all this and I say that you must be a human first, because these people have feelings as well and they need someone to hear them and understand that people are not just numbers. In life, everything can change in a second. On receiving the award you said that not everything is great in the police, but that it could be worse. Police salaries are not exactly high, and those who have decided to become police officers did not do it for money reasons. It is not easy here, the work is demanding and responsible, but I am aware that others do not have it easy either. There are many people who receive low and minimum salary for heavy work.